November 02, 2018 – REGINA HAMPTON, M.D. After treatment, remaining breast cancer cells can lie dormant for years before causing a recurrence. Researchers are investigating how to stop them. 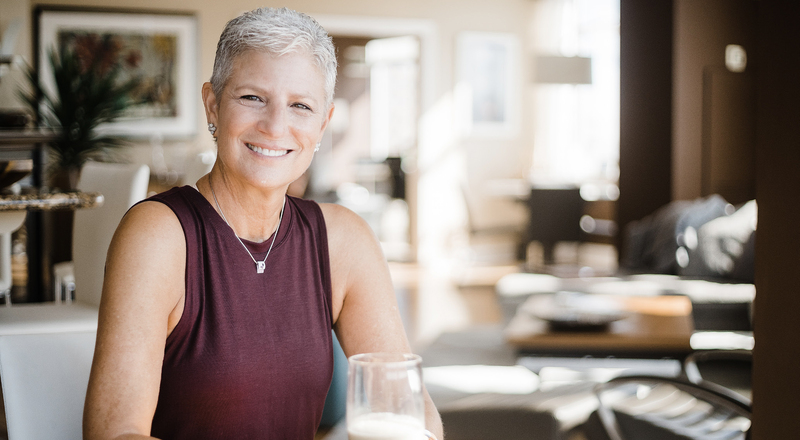 Thirteen years after undergoing a double mastectomy to treat a recurrence of breast cancer, Patti Aluise felt numbness in her lower right jaw. Figuring it was a tooth problem, she went to her dentist, who couldn’t find anything wrong. Then, in March 2014, the numbness came back, and Aluise had shoulder pain, too. Visits to an oral surgeon and a neurologist yielded no answers aside from “probably arthritis.” That October, as the pain grew worse, Aluise made an appointment with a neurologist at Johns Hopkins Medicine in Baltimore, an easy drive from her home. The neurologist was concerned about Aluise’s cancer history: an initial diagnosis of ductal carcinoma in situ in 1995, followed by lumpectomies in both breasts and radiation, and then the recurrence and mastectomy in 2001. The doctor ordered a full-body CT scan, which revealed that Aluise’s breast cancer had returned and spread to her bones. “Never in my wildest dreams did I think it would be cancer,” says the 66-year-old retired staff assistant for the federal government. With each passing year, Aluise had been confident she was cured, especially because her breasts — where the cancer had originated — were gone. “I was told I had a 5 percent or lower chance of recurrence. I thought that was good,” she says. Aluise consulted with an oncologist at Medstar Georgetown University Hospital, who referred her to a trial of a drug in a new class of medicines called CDK4/6 inhibitors, which block breast cancer cells’ ability to divide and proliferate. This drug was combined with an aromatase inhibitor (AI), a medicine commonly used to prevent recurrences of hormone-driven breast cancer. The nodules in her lungs shrank, and the scans she receives about every four months show no signs that the cancer is progressing. She remains on the treatments and had a rod surgically inserted in her right arm to strengthen a bone that was weakened by a metastatic breast cancer lesion and at risk of fracture. Even when breast cancer is caught early and successfully treated, all patients face some risk that their disease will return. Particularly in women with estrogen receptor (ER)-positive disease, a recurrence can happen even after two or three decades, and by then, the cancer has metastasized beyond its original site. The risk of recurrence is based on the original diagnosis and the treatments given to lower the chance that the cancer will come back. In 2017, data were shared from a large analysis of 88 breast cancer trials involving nearly 63,000 women with stage 1 ER-positive breast cancer who received five years of endocrine therapy — tamoxifen for the entire period or for a few years and then followed by an AI — and no treatment afterward. The authors concluded that patients with stage 1 disease faced a 13 percent risk of distant recurrence over the next 15 years if their original cancer had not spread to any lymph nodes. That risk grew to 20 percent if one to three nodes were involved and 34 percent if the cancer had spread to between four and nine nodes. Also, the rate of recurrence (the percentage of survivors experiencing recurrences every year) was about the same over time for each risk group, with no signs of tapering off, even over 20 years. Many studies underway aim to reveal why the disease comes back, but generally, experts believe that breastcancer cells remaining in the body after treatment can circulate in the blood, find a hidden resting place and go dormant for decades. Eventually, something stimulates them to “wake up” and start multiplying; one recent study suggested that inflammation is to blame. By shedding light on this process, the research could lead to better methods for preventing and treating these recurrences. Some experimental treatments for recurring breast cancer are based on recent research into why dormant breast cancer cells come back to life after several years. One approach focuses on a process called autophagy, in which cells recycle their own components and debris to use as an energy source. NCI researchers, as well as a separate group at the University of Pennsylvania (Penn), observed autophagy in dormant breast cancer cells taken from mouse models. Then they tested a drug that interferes with autophagy — the antimalarial hydroxychloroquine — in mice. The results were so promising that Penn researchers, led by Angela DeMichele, M.D., M.S.C.E., a professor of medicine and epidemiology, are testing it in a clinical trial called CLEVER. Some of the participants will take the drug by itself, whereas others will also receive the biological drug Afinitor (everolimus), which is approved in combination with hormonal therapy for advanced hormone receptor-positive breast cancer. Another trial run by Penn researchers, GLACIER, will combine hydroxychloroquine with gedatolisib, an experimental drug that inhibits cell signals involved in tumor growth. It works by blocking two enzymes, PI3K and mTOR, that are involved in signaling. Another strategy being investigated: treating earlystage breast cancer with immunotherapy to reduce the risk of recurrence. For example, researchers at Memorial Sloan Kettering Cancer Center in New York City are testing a presurgical combination of Yervoy (ipilimumab) plus Opdivo (nivolumab) — immunotherapies known as checkpoint inhibitors that block the activity of certain proteins to help free up the immune system — with cryoablation, a freezing process that kills cancer cells in patients with early-stage breast cancer. The idea is to train the immune system to recognize the cancer early on and generate long-term “immune memory” to prevent it from coming back. Breast cancer that recurs several years after the original diagnosis can be difficult to treat with standard therapies, and immunotherapy is also being investigated in that setting. Immunotherapy drugs, particularly checkpoint inhibitors, so far have shown just modest efficacy in metastatic breast cancer. Early evidence suggests that drugs like Keytruda (pembrolizumab), which blocks the checkpoint PD-1, may have be effective in triple-negative (non-hormone-sensitive) breast cancer, and some studies in ER-positive breast cancer are underway. Several other checkpoint inhibitors and therapeutic vaccines are also being tested in metastatic breast cancer. After treatment for ER-positive breast cancer, it’s standard practice for women to undergo long-term maintenance treatment with pills that suppress estrogen — AIs — to help prevent recurrence. Typically, these drugs are given for five years, but questions remain about whether longer treatment might bring greater benefit. “We are not certain if continuing an aromatase inhibitor after taking one for a full five years reduces the risk of recurrence,” says Daniel Hayes, M.D., the Stuart B. Padnos Professor of Breast Cancer Research at the University of Michigan Rogel Cancer Center in Ann Arbor and co-author of the analysis of 88 studies on breast cancer recurrence. “It’s a challenge to advise women as to whether the benefits of additional therapy would outweigh the risks.” These include side effects such as hot flashes, vaginal dryness, and muscle and joint aches and pains, as well as more serious toxicities such as bone loss and fracture, and possibly heart problems. Both tamoxifen and AIs block estrogen’s ability to drive breast cancer cells but take different approaches. Tamoxifen, which is known as a selective estrogen receptor modulator, interacts with the receptor itself to keep the hormone from activating the cell, whereas AIs reduce estrogen production in postmenopausal women. That decision can be challenging for patients and physicians. Two large studies of tamoxifen published a few years ago suggested that taking the medication for 10 years lowered the incidence of recurrence, reduced breast cancer deaths and improved survival. However, for women who either take tamoxifen and then switch to an AI or start with an AI right away, the benefits of continuing an AI beyond five years are not so clear-cut. A study published in 2017 tested different strategies in women who had completed five years of either tamoxifen or an AI. The researchers found no difference in how long the women lived, either without disease or overall, whether they took the AI Arimidex (anastrazole) for two years or five years after the initial regimen. The idea of using other targeted therapies along with AIs to prevent breast cancer recurrences is catching on, thanks to positive results in patients with advanced disease. In one trial, combining the CDK4/6 inhibitor Ibrance (palbociclib) with the AI Femara (letrozole) reduced the risk of disease progression by 44 percent and improved the time without progression by more than one year, compared with Femara alone. The most common side effects were low white blood cell counts, infections, nausea and fatigue. However, whether CDK 4/6 inhibitors can work in early-stage breast cancer and lower recurrence risk further than hormonal therapy alone remains to be seen, with several large trials in progress. When Vicki Singer Wolf’s breast cancer returned in 2016 — 21 years after her initial diagnosis and 10 years after one recurrence — she opted for a double mastectomy, followed by chemotherapy. Now in her second year of treatment with an AI, she is focusing on adopting healthy habits, such as eating a mostly plant- and fish-based diet and exercising regularly. She hopes that these lifestyle changes will both prevent her cancer from coming back and help her deal with the medicine’s side effects, which include occasional joint pain, fatigue and insomnia. “I have three wonderful grandchildren that I’m around a lot. I want to have the energy to play with them,” says Singer Wolf, 60. Many oncologists who treat breast cancer also are concerned with survivors’ eating habits, encouraging patients to achieve and maintain a healthy weight as a potential way to lower the risk of recurrences. Last year, the Centers for Disease Control and Prevention published a study linking obesity with an increased risk of13 cancers, including of the breast. And several observational studies have suggested that women who eat high-fat foods or gain weight after a diagnosis of breast cancer face an elevated risk of recurrence, particularly if they are postmenopausal. The data may arrive soon. In one study, 2,400 women who cut their fat intake to 20 percent of daily calories (down from 30 percent) lowered their risk of breast cancer recurrence by 24 percent, compared with women who didn’t change their eating habits. But that was 15 years ago, and evidence in favor of weight loss remains sparse, so Harvard-led researchers are conducting a trial of more than 3,000 women who have been treated for stage 2 to 3 HER2-negative breast cancer and have a BMI of at least 27. The participants will receive either two years of a weightloss intervention program, complete with telephone coaching and exercise goals, or educational materials about weight loss in addition to routine follow-up. The women will be followed for five years, and the researchers hope to find a 4 percent decrease in recurrence risk in those who undergo rigorous weight loss. Another question that researchers are trying to answer is whether specific genes raise the risk of breast cancer recurrences. Researchers in the Netherlands reported recently that women with BRCA1 gene mutations were 1.5 times more likely to experience recurrences over a 15-year study period than were noncarriers. Women with BRCA2 gene mutations did not face an elevated risk, but people with any BRCA mutation have an overall elevated risk of developing new cancers, including breast tumors that are unrelated to the ones that were initially treated. In 2005, Singer Wolf discovered that she has a BRCA2 mutation, so now she follows a strict surveillance plan for new or recurring cancer. Every three months, she has her blood cell and thyroid levels tested, plus physical exams of her breasts and lymph nodes, as well as regular colonoscopies and skin checkups.